Date Originally posted: Saturday 27 February 2011. So I read The Short Second Life of Bree Tanner a few months back and I read it in two days I really thoroughly enjoyed it. Stephenie gives us a real insight as too what newborn blood thirsty vampires are really like and shows us the emotions they go through since we have recondition of this in The Twilight Saga (Twilight, New moon, Eclipse and Breaking dawn) we do hear a tiny bit of what Jasper's life was like in Eclipse and what it was like for him but as all the books are in Bella's perspective we are not really able to know what it is like and this book reveals all. Starting with Bree we all know she surrenders herself to Carlisle in Eclipse that was the first we read of her little did we know that she would have her own novella. When I started reading The Short Second Life of Bree Tanner I started to see a side of her that I thought wasn't even possible and I read on more I started to really like her character she isn't the evil new born we all thought she was but a young vulnerable girl that Riley kills for Victoria's army. Bree becomes good friends with another vampire Riley has created and by reading it you can see they are starting to fall for each other. When I read it I cried that Bree died because I really didn't want her too even though I knew she was going to die. The vampire that Bree starts to have a close bond with is Diego. Though they only started to really bond in one day it shows you they are intense about each other. Diego was another character I started to really like in the book. When I read he was dead it felt like an important character was gone. I had started to really like reading about Bree and Diego and although both of them die it's kind of like a love story for them. I would have loved for them to both stay alive. There is a vampire called Fred who has quite an unusual gift. He is interesting because his gift has never been known to us. Fred can make vampires stay away from him, he can make vampires feel like they are repulsed if they go near him. He is also very quiet that some vampire would not know he exists. Near the end of the book he pulls Bree to one corner when they are leaving to go to the clearing and asks her to away with him to not fight and to leave Riley but we know she doesn't because Riley has told her that Diego is waiting for her at the clearing and she wants to go see him so Fred leaves on his own and asks her to meet him the next day if she survives. We get to see a close friend-ship that could have been if Bree had been kept alive between Bree and Fred. The character who I ended up hating and was glad that dies was Riley. In Eclipse all we find out about him is that he loves Victoria and thinks she does to. But we know she doesn't. We read that Riley in fact kills Diego and doesn't tell Bree. He lies to her the whole time. To me at the start before he changes her he kind of manipulates her. I am really glad he died. In the book there is a surprise that everyone had no idea about! The Volturi pay a visit to Victoria. We know this as Bree and Diego are close to the house to where Victoria is staying when they arrive. The Volturi knew exactly what Victoria was up to and told her to make sure she succeeds in killing the Cullen's. We know Edward finds this out as Bree thinks it so she can tel him everything she knows. 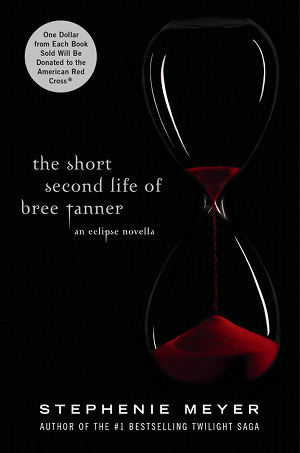 To me The Second Short Life of Bree Tanner is a must-have for all Twilight Saga fans. It was an amazing story that I could read and read again. With surprises, knowledge and a great insight to blood thirsty new born vampires! I read this book recently and really enjoyed it. I think it is a great companion book to the Twighlight series. I liked finding out about Bree and what was going through her mind. Also- I felt the same way about Riley. I really liked this book. It was refreshing to get a glimpse of the vampire world from a vampire, rather than just Bella's POV. It really humanizes, so to speak, the villains.